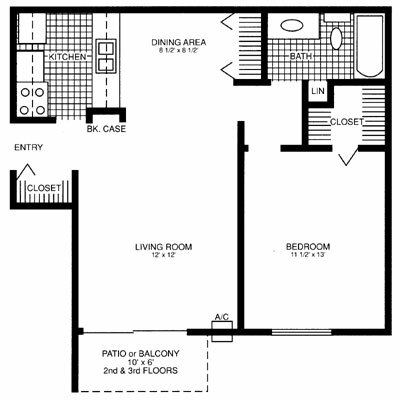 Below is a brief outline of our 1 bedroom and 2 bedroom apartments. All dimensions are approximate. Plans and dimensions may contain minor variations. A fabulous layout, beautiful cabinetry and unique brick wall in your living room is what gives our one bedroom its sense of style. You will find a wonderful built-in bookshelf and separate dining room area with a lighted ceiling fan. This one bedroom is incredible and spacious giving ample room for all your decorating needs. 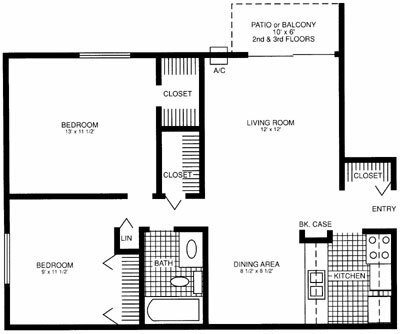 The two bedroom apartment home is a sight to see with its large closets and generous room sizes. You will find a wonderful built-in bookshelf and separate dining area. Second and third floor apartment homes have spacious balconies that are great for patio furniture and for those who garden. The two bedroom is definitely a place you and your family can call HOME!